Egyptian Foreign Minister Sameh Shoukry has told his Italian counterpart Paolo Gentiloni that Egypt is “keen” to “fully cooperate” with Italy in the investigation into the mysterious death of PhD student Giulio Regeni. 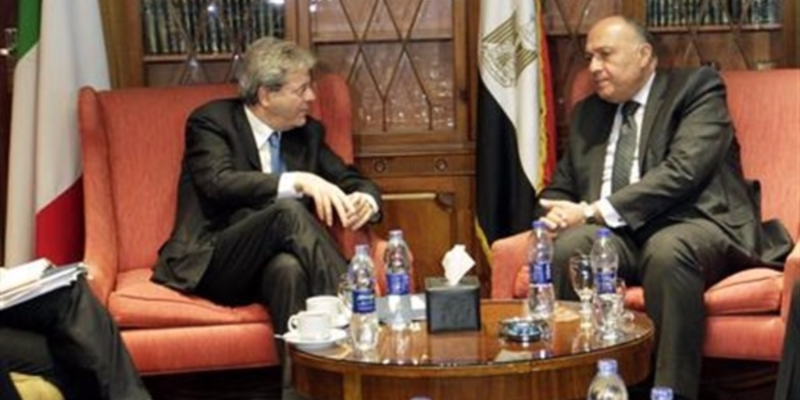 According to a statement from foreign ministry spokesman Ahmed Abu Zeid, Shoukry and Gentiloni “agreed to enhance mechanisms of cooperation and coordination” between the two countries to ascertain the cause of Regeni’s death. Meanwhile, Egypt’s Assistant Foreign Minister for Cabinet Affairs summoned Italy’s ambassador to Cairo to offer his condolences to the Italian government and Regeni’s family and reiterate Egypt’s commitment to cooperating with Italy throughout the investigation. Egypt’s Prosecutor General Nabil Ahmed Sadek ordered an “exhaustive investigation” into Regeni’s death, emphasizing the need for the its speedy completion. Egyptian prosecutor Ahmed Nagy, who is heading the team investigating Regeni’s death, told the Associated Press that the student’s body had “signs of torture,” including cigarette burns and multiple stab wounds. However, some local media outlets had cited the deputy head of investigations at Giza’s police department as saying Regeni may have been killed in a road accident. Italian media reported on Wednesday that Regeni’s body had been found “in a ditch” on the outskirts of Cairo, citing the Italian foreign ministry. Regeni’s parents, who arrived in Cairo days after their son’s disappearance was announced, identified the student’s body at Zenhom morgue, Aswat Masriya reported. Before he “mysteriously disappeared,” 28-year-old Regeni was reportedly last seen on January 25 in downtown Cairo, where police presence was heavy due to fears of demonstrations on the fifth anniversary of Egypt’s 2011 revolution. According to media reports, he arrived in Cairo in September and was carrying out field research regarding trade unions for his PhD at Cambridge University.